A lot of people have asked us how we decide where we are going to travel next and “Why Guatemala?” in particular for this trip. The truth is we really hadn’t planned on going to Guatemala at all, at least not at first. We were really hoping to go some place further afield like Burma or New Zealand, but the airfare costs an arm and a leg and both destinations involved days of travel just to get there. We decided we had better look closer to home and remembered all of the good things travelers we’ve met on the road had told us about Guatemala. With Mayan ruins, cute colonial towns, and indigenous culture, it seemed like a good choice. Besides, we had never traveled to Central America together, and we found a pretty reasonable airfare, so: ¡Vamos a Guatemala! We arrived in Guatemala City after a pleasant 1-stop flight through Houston. It was nice to arrive in terra nova in only a half-day’s travel, in the same time zone. Translation: no jet lag! Perhaps the only downside was the landing: fairly windy as the pilot maneuvered a 180-degree turn while dropping altitude rapidly. Before we knew it we were bouncing on the tarmac with a “¡Bienvenidos a Guatemala!” Another bonus for all of you passport sluts out there (not us, of course! 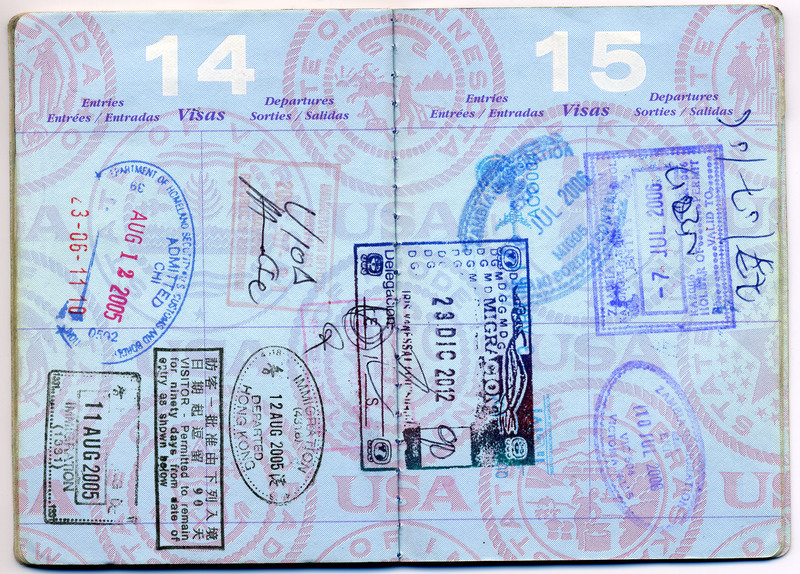 ), Guatemala has a rather prominent passport stamp with no visa entry fee required. This makes us smile. Since it was the Sunday before Christmas, we were concerned about banks being open. The rate at the currency exchange counters was atrocious, but we were fortunate to find a bank at the airport (3rd floor, just ask for directions) that changed money at an excellent rate for no commission. We took a taxi to the bus terminal where we stored our bags for the few hours we had to explore before catching an overnight bus to Flores. 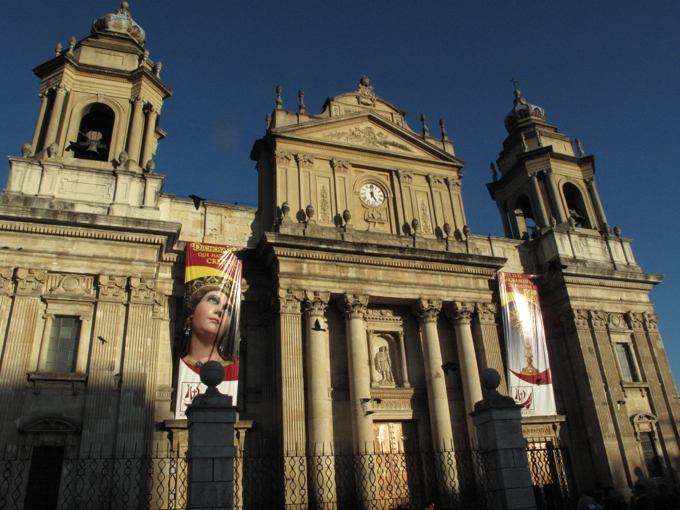 As luck would have it, the bus station was a short walk to Avenida La Sexta, the heart of Guatemala City. 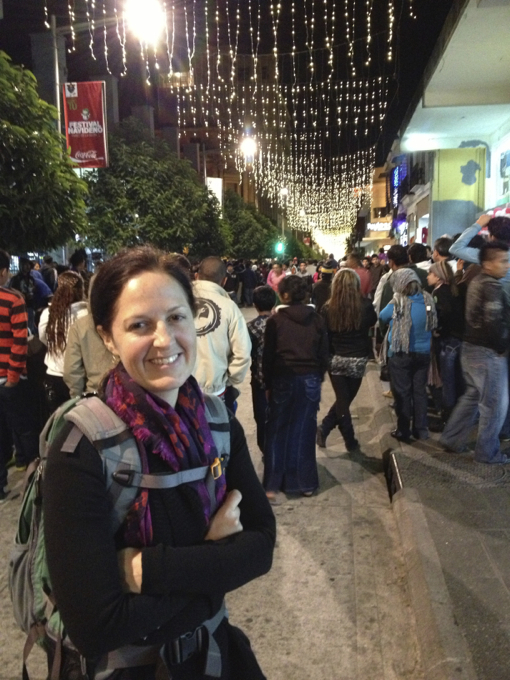 This multi-block pedestrian zone was packed shoulder-to-shoulder with families from Guate (the nickname of the city), strolling the avenue, enjoying the variety of street performers, eating elotes (corn on the cob smothered in mayo and chili) and looking forward to the holiday. 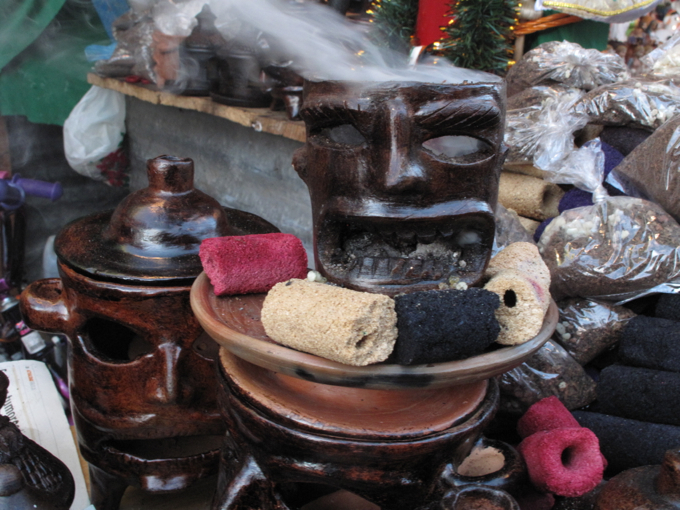 Apparently, strolling the avenue is a time-honored tradition in Guate called sexteando, and we enjoyed participating, taking in the sights, sounds and smells of Avenida La Sexta. At the northern end of La Sexta there was a Festival Navideño, complete with an ice-skating rink and “snow-tubing” hill. It seemed strange to us to see folks enjoying these cold-weather activities in a tropical climate, but they were clearly popular; long lines of people waiting patiently to get in stretched for a city block. 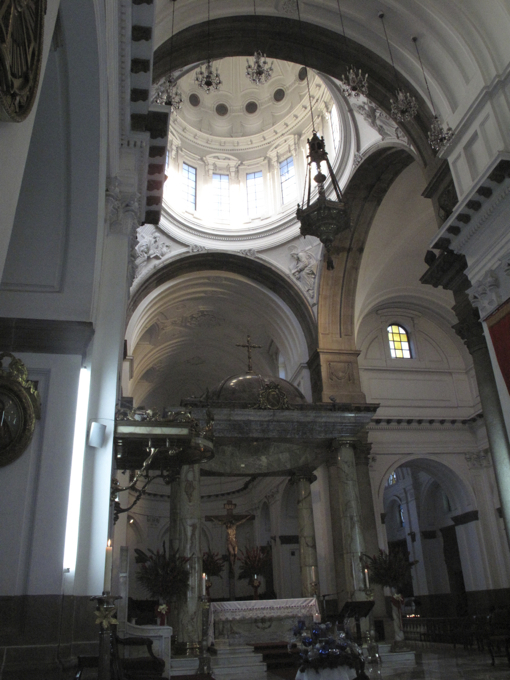 We wandered into a few churches and strolled the markets before grabbing a bite to eat. Some Christmas decorations in the market looked familiar. While others were new to us. 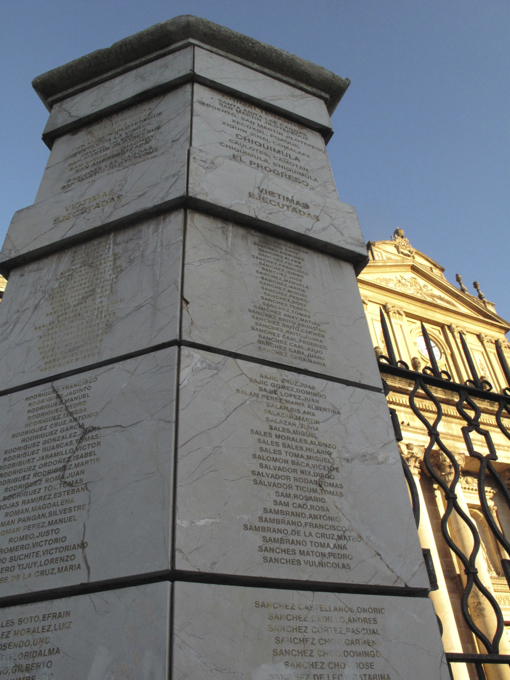 This monument to executed victims reminded us of Guatemala’s turbulent history. 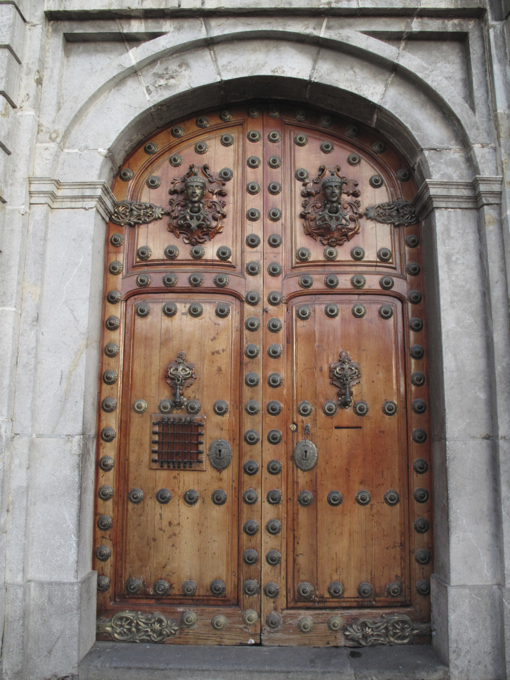 While this grand doorway reminded us of its colonial heritage. Satisfied with our brief time in Guate, we headed to the bus station to catch the overnight luxury bus north to Flores and the land of the Maya. The bus was reasonably comfortable except for the air-conditioning that seemed to be set to Arctic temperatures. If you take an overnight bus in Guatemala, be sure to bring a blanket and your bufanda. Sporting a bufanda of my own on La Sexta! What a great Christmas get-away. Beautiful pictures. Alison you look lovely in your bufanda! Viva Guatemala! Thanks, Sara! 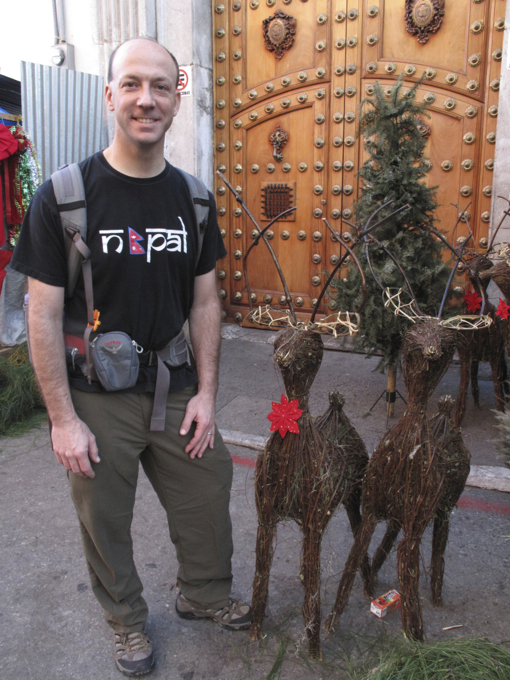 Guatemala was a nice destination for a Christmas get-away. And nobody can rock a bufanda like you! Hi Melissa! Thank you for checking out our blog and for passing along the address of yours. Your account of the hiking trip is fantastic. I look forward to future posts from you! Sounds amazing, can’t wait to hear more… what a great way to keep us all updated on your exotic adventures! Love and hugs. Hi Yeshie! It’s so nice to hear from you. We hope that all is well with you and the family. We must get over to England sometime soon to visit–it’s been way too long!